I’m always posting some interesting links up on my FB profile. I used to be one of those annoying people who linked their Twitter account to Facebook, thus all my friends then get the impression I’m a serious alcoholic or an out-and-about partyer. Then I used Selective Twitter, so no one sees every single tweet, which is now moot since I haven’t tweeted much lately. Getting back to the good ol’ FB profile, I now post a lot of links to express myself instead of giving every little bit of mundane piece of information. However, the links anyone chooses to post can say quite a bit about themselves. In my case, the most of the recent articles shared from the Chronicles of Higher Education point to my malaise about having gone through grad school, adjuncting, and the now anorexic amount of job opportunities (especially for higher degree holders). Also, here and there, there’s a shiny bit of news that catches my attention and I have to share those with everyone too. Last night, Facebook decided to go the Oprah route and hype up it’s new function with all the anticipation leading up to it. Of all days and times, Facebook opens the doors to creating a vanity URL on a Friday night, when people are out and about. In the early 21st century, that’s never an excuse as you can access the web with an iPhone or Crackberry, and if you’re seriously desperate for something more wieldy, a laptop, yours or someone else’s. Last night, at the tWineUp, a someone else offered his laptop for all present to register their vanity URLS. I did it from my iPhone. I finally secured a Shindo* name added on of these sites: http://www.facebook.com/shindo. I am the Shindo, not ShindoTV. Finally. Well, I’d have to buy Shindo.Com for that to be true, but that would be expensive. Too expensive. It’s so easy to get caught up in the silliness that is Facebook: the quizzes, the applications, the five favorite things. They can be so engrossing and so distracting. Who can’t resist a Greenpatch or an invitation to get involved in someone’s Mafia Wars? Chris’s post about this trend just seemed reactionary. How could someone not like Easter Eggs? It’s like saying you don’t like Christmas. 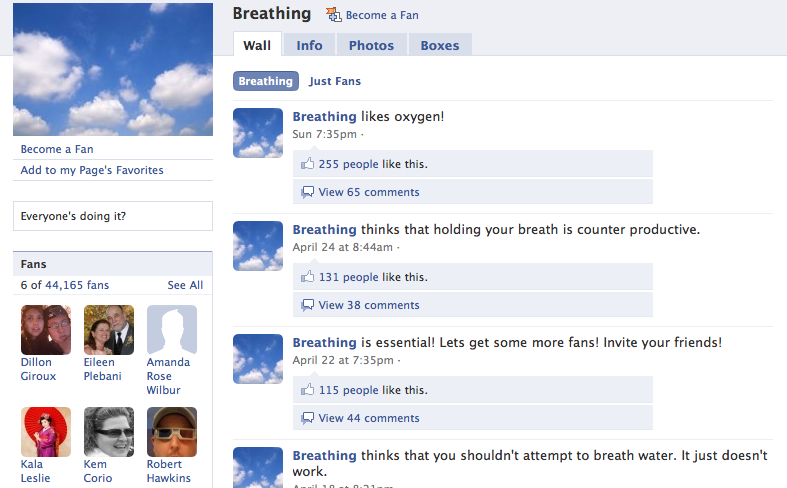 * Even I get to a point where I’ll see things have become utterly ridiculous, as people can now become a fan of breathing. The universe officially ended yesterday when Brian succumbed to the Facebook meme. His doing the 25 things created a rip in the space-time continuum so great, all our realities will soon collapse… Actually, I love how he subverted the trend by doing the post on his blog rather than post it as a note on Facebook. I’ve been trying to ignore the meme after getting tagged several times. After being tagged for the seventh time, I figure why not. I have a blog, dammit, and I’m no Facebook Notes poster. Also, ShindoTV’s all mine, but I won’t belabor this point any further.